What is Bandpass Filter Technology™? Why does Bandpass Filter Technology™ make our Reference HDMI Cable Ultra Low Jitter? In order to minimise cable induced jitter, QED utilises a special passive band pass filter built unobtrusively into the head shell of the Reference range of HDMI cables. What is Cable Induced Jitter? Jitter is the accumulation of unwanted timing errors in a digital signal when compared to a known reference signal. A typical Bluray player should produce a rock steady output. However, because of its natural impedance, the cable induces delay in the time it takes for the signal to rise and fall. There are multiple sets of conductors in the cable and the timing delay on each set will be different,adding random skew between them. Jitter is measured in picoseconds (trillionths of a second). This does not sound a lot but it is significant at the speeds required for HDMI. 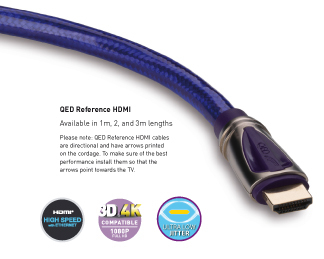 The cable is the weakest link in the HDMI chain and as data rates increase to allow for better picture quality and extra features such as 4K and 3D, more is expected of it. Unfortunately, unless something is done, the effects of cable induced jitter impose an upper limit to the amount of data that can be carried and this reduces as cable length increases. It should be noted that there is no error correction mechanism in the HDMI link and as the jitter increases, bit errors can be introduced into the video data that are then allowed to appear on the TV. These errors can affect viewer enjoyment of the program material and in subjective viewing trials, clear differences in picture quality are reported by reviewers when comparing different HDMI cables. To enable us to achieve Ultra Low Jitter levels we needed to develop a cable which utilised Bandpass Filter Technology™. Sited at the TV end of the cable the band pass filter effectively removes components of the signal above and below the HDMI frequency range which contribute to unwanted timing errors. Although the filter reduces the amplitude of the signal, it does not drop below the required level specified by the HDMI standard body. The filter we have developed at QED has the effect of reducing cable induced timing errors to less than half that found in a typical branded cable of the same length and specification. The trace on the left shows an eye diagram of a typical 3m HDMI cable running at 10.2 Gb/s - the test a High Speed cable has to pass. To qualify as a High Speed cable, none of the signal samples should lie within the purple mask area. Although the cable shown passes the High Speed test, you can see the induced jitter makes the plot appear fuzzy. The jitter for this cable was measured at 103ps, which brings it very close to the mask and might allow noticeable errors to slip through to the TV. Measurements were taken using QED's own laboratory test equipment. QED is the only UK manufacturer with this invaluable facility (At time of writing). The diagram on the right shows a QED Reference cable of the same length at the same speed. The plot is much cleaner as the induced jitter is reduced by our Bandpass Filter Technology™ to just 37 ps, guaranteeing you will get the most out of your TV or home theatre system.